About Us – Sugar vs the Reef ? We are a group of artists from NSW who have jumped in the deep end, travelling thousands of miles to the canefields of Mackay in Central Queensland. We’re here to learn from farmers, gardeners, reef scientists, traditional custodians, and families whose ancestors grew, cut and milled cane in this part of the world. Exploring the tensions between cultural values, environmental values and economic values is what makes us tick. Lucas Ihlein is an artist from Wollongong. His work explores the relationship between socially engaged art, agriculture and ecological management. Recent projects include The Yeomans Project (with Ian Milliss), AGNSW (2013-14); Green Bans Art Walk, Sydney (2011); In the Balance: Art for a Changing World, MCA, Sydney (2010). Adelaide (2002). In 2015 he received an Australia Council for the Arts Fellowship for Emerging and Experimental Arts. 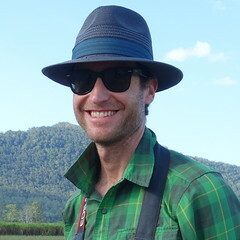 He is an ARC DECRA Research Fellow at University of Wollongong, Australia. Kim Williams works in multimedia installation, sculpture and drawing. 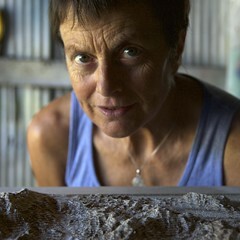 She has recently exhibited at Wollongong Art Gallery, Broken Hill Regional Gallery, and Maitland Regional Gallery. Kim has a background in arts-based community cultural development. Her recent work uses walking in remote and urban places as a way of ‘ground truthing’. Kim has a Masters of Creative Arts (Research) from University of Wollongong, and is now working on a PhD on collaboration, art and the environment. 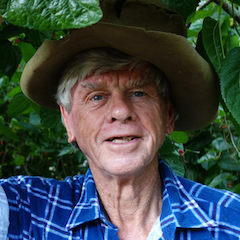 Ian Milliss began exhibiting in 1967 as the youngest member of the Central Street Gallery group and one of Australia’s first conceptual artists. From 1971 he developed a practice based on cultural activism working with community and political groups, arguing that the artist’s role is the adaptation and innovation of cultural memes rather than content production for the art market. He has worked in the Green Bans, prison reform and trade union movements and has dealt with a wide range of cultural issues including workers and artists rights, sustainable farming, heritage and conservation, and climate change. John Sweet is a retired Cattleman who worked with PA Yeomans to drought-proof “Rugby Run” from 1980-88. John is a passionate advocate for rejuvenating the catchment of the Great Barrier Reef using the Keyline principals “Minerals, Mulch, Microbes and Moisture”. He is an active member of the Local Marine Advisory Committee (LMAC) of the Great Barrier Reef Marine Park Authority. John requests we listen to Hippocrates’ words and the Wisdom of the Elders: “First do no harm” & “Let Food be thy Medicine”. John is our local Mackay contact for Sugar vs the Reef?.